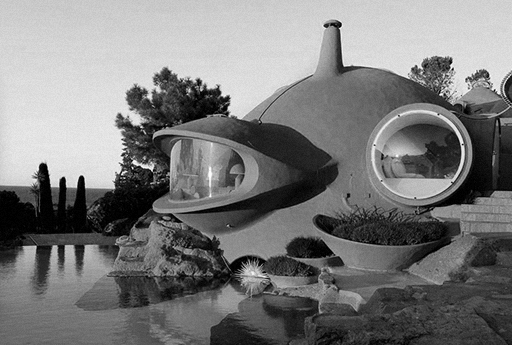 The renovation was supervised by architect Odile Decq and lasted five years. Most of the craftsmen who worked on the building site had already worked with Antti Lovag. Their expertise helped to resolve the many challenges which cropped up during the renovation. 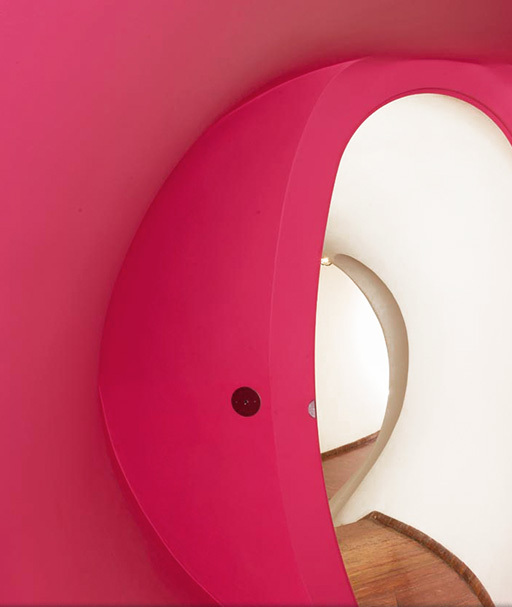 Odile Decq has an architectural style that questions where body and senses are positioned in living spaces. All of her projects are designed with the idea of a circuit and aim for interactive architecture, be it for the Banque Populaire de l’Ouest in Rennes or the MACRO in Rome and FRAC contemporary art museums in Brittany. Odile Decq describes her discovery of the house and her first impressions. She explains how she first had to become acclimated to Antti Lovag’s architecture before beginning work and how she used color to structure her renovation of the house. Isabelle Bernard fully committed to the renovation of the house by selecting architect Odile Decq to conduct the work. Together, they both took great care to preserve the house’s identity while continuing the adventure that had motivated Pierre Bernard and Antti Lovag. After their father passed away, Isabelle and Jean Patrice Bernard decided to write a new chapter in the history of the house, ensuring that it remains a place conducive to creativity. The first step was renovation work that reclaimed and modernized the house. Isabelle and Jean Patrice Bernard would like to especially thank Odile Decq pour her passionate commitment to this adventure. A special thanks as well to Yves Gellie, whose creativity, sensitivity and enthusiasm made the completion of this project possible. They thank Pauline Schleimer & David Després for their involvment and enthusiasm in the website’s creation. This Web site belongs to and is published by the Maison Bernard Endowment Fund domiciled at 21 rue Soufflot, 75005 Paris, France, published in France’s Official Journal under the reference number 20130023 on June 8th 2013. The general structure, as well as texts, photos, videos, and sound recordings comprising this site are the property of the Maison Bernard Endowment Fund or other authors for whose works the Maison Bernard Endowment Fund obtained reproduction and usage authorizations. The entire contents of this site fall under French and international legislation on copyright and intellectual property. All reproduction rights are reserved, including downloadable documents and iconographic, sound and photographic representations and recordings. Any total or partial representation of this site or of one or more of these components, by any process whatsoever, without the express permission of the Maison Bernard Endowment Fund, is prohibited and constitutes an infringement punishable by articles L.335 – 2 and subsequent articles of the Intellectual Property Code. In accordance with France’s Data Protection Law (“informatique et Libertés”) of January 6, 1978, amended in 2004, you have a right to access and rectify information concerning you, which you can exercise by contacting the Maison BernardEndowment Fund, 21 rue Soufflot, 75005 Paris. You can also, for legitimate reasons, oppose the processing of data concerning you.